Wow, would you look at the antenna hump on that Moto Z3 5G Mod? I’ve not seen anything like it since my Dad’s Nokia 6110. But credit to Motorola, the company has form when it comes to impressive antennas. Who remembers the world’s first mobile phone — Motorola DynaTAC? Smartphones aren’t such a fan of this look these days and the fact that the industry’s first piece of consumer 5G equipment is so bulky is a telling and worrying sign. We’re used to our smartphones being sleek, thin, and comfortable to hold in our hand. This pursuit hasn’t been without its casualties, like the headphone jack, but on the whole, people want their phones to look good when they spend big bucks. The Moto Z3 with the 5G Moto Mod attached certainly isn’t slick and it looks like the first 5G smartphones are going to be pretty bulky if they’re to fit the necessary antennas and bigger batteries in them. If that’s the case, the Moto Z3’s Mod might actually be the more elegant solution. Why does it need that antenna? The transition to 5G will see the introduction of lots of new networking spectrum combine together to boost speeds. New low-frequency antennas, like T-Mobile’s 600MHz spectrum, and sub-6GHz Wi-Fi channels are integrating into smartphones without a major aesthetic overhaul. Although the move to bigger MIMO antenna arrays does present some design considerations, we’re already using these technologies in today’s phones. The carrier aggregation technology will just be scaling up with 5G. However, very high-frequency mmWave technology is different. It requires not only a new antenna design but also extra careful antenna placement considerations. Most materials, including the device’s case, block and attenuate mmWave signs. Worse still, the hand you hold your phone with can completely block out these waves. Poking this antenna up outside the phone is a short-term workaround. We know for a fact that mmWave technology is inside in this 5G Moto Mod. 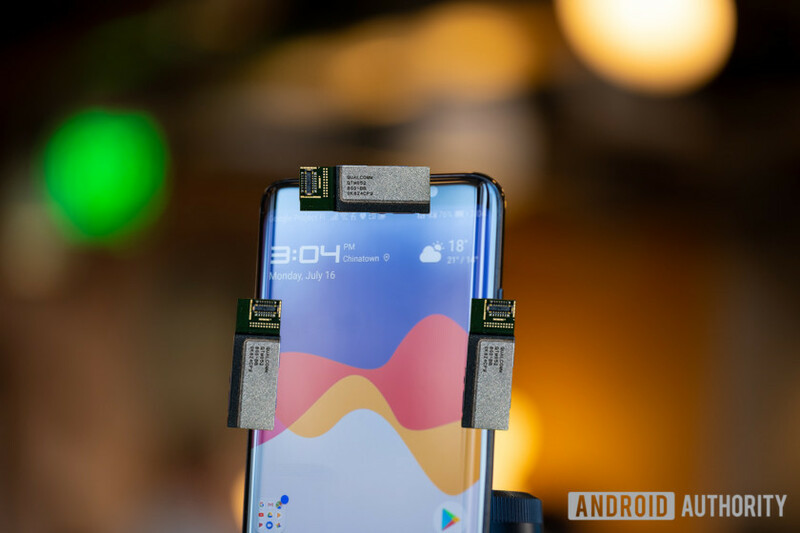 According to Qualcomm, “once the 5G Moto Mod is attached to its back, it gains the ability to access mmWave 5G using the Snapdragon X50 5G modem, and the latest in 4G technology with the Snapdragon X24 LTE modem.” More importantly, there’s also the company’s QTM052 mmWave antenna module inside the Mod. In fact, the Mod’s antenna bump looks like a perfect size match. What sacrifices will be made so phones can fit multiple 5G antennas inside their slim form factors? The QTM052 is very compact, but it certainly isn’t as slim as the tiny antenna lines you’ll find somewhere on your current phone. Furthermore, Qualcomm notes that you’ll want three or more of these inside a regular phone to avoid signal blockage, or four for a mobile hotspot. The Moto Mod gets away with just one because of its external placement. How will 5G smartphones rumored for 2019 release fit this technology inside without compromising their aesthetic design or other features? Careful antenna placement has potential implications for thin edge displays, under display fingerprint scanners, volume rocker positioning, speaker and camera placements, and perhaps more. Then there’s the extra cost. A phone with three 5G antenna placements to avoid signal blockage. Fitting these on the inside will be a bigger challenge than the Moto Z3’s 5G Mod. Internal smartphone space is at a premium and 5G antennas pose a problem there, but it gets worse. 5G mmWave technology is also power hungry and that means future phones will require bigger batteries too. Just where is this all going to fit? Will we need huge 5,000mAh batteries to power 5G phones? It’s possible that the Mod is overly generous with this extra capacity simple because it can fit it inside the accessory without making it any larger than it needs to be. Let’s be lenient and estimate that a powerful 5G flagship smartphone requires a smaller 4,500mAh battery. This is still significantly larger than 2018’s average flagship battery capacity of approximately 3,400mAh. This works out to a whopping 32-percent increase in required battery area inside an average phone or an equivalent increase in power area density, neither of which are plausible right now. 5G phones require much larger batteries to last through the day and that almost certainly means even thicker designs. There’s a reason why Qualcomm’s 2017 5G smartphone prototype, pictured above, is so bulky and why Motorola is debuting 5G as a Mod first rather than integrating the tech into the Moto Z3 itself. 5G requires multiple additional antennas and a bigger battery than ever before. The first 5G smartphones are likely to be bigger and thicker and more expensive, or sacrifice other features to fit these components in, or offer a compromised 5G experience with weak signals and/or poor battery life. Over the next few years, modem and antenna technologies for 5G mmWave will undoubtedly shrink further. Trends suggest that battery capacity is on the increase too, with 3,500 to 4,000mAh becoming the norm in the next couple of years. Once this happens, 5G smartphones will certainly be more practical to build. Until then, you might want to hold off being an early adopter if you like your smartphones sleek and with battery life that lasts all day.